Yesterday, we reported in great detail about the 2013 Hero Karizma R and the Karizma ZMR. While the ‘boys’ out there are waiting with great excitement to get their hands on the updated ZMA and ZMR, the girls can look forward to the 2013 iteration of Pleasure- Hero’s female-specific scooter. Hero has also unveiled a new special edition of its gearless scooter. Christened as the Hero Pleasure Special Edition, the latest special variant of the Pleasure gets two-tone white and blue paint job and some new decals. 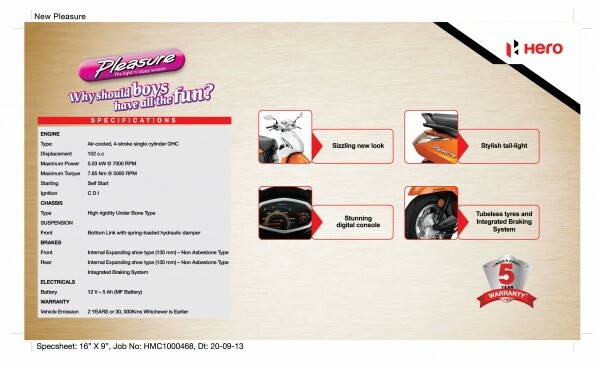 Both the Pleasure facelift and the Pleasure Special Edition get Hero Integrated Braking System (IBS). Integrated Braking System is nothing but Hero’s response to ex-partner and arch rival Honda’s Combi Braking System (CBS). Very much like the CBS, the IBS ensures that both the front and rear brakes are applied even if the rider applies either of the two. Other new features that can be found on the updated Pleasure are- luggage compartment light, mobile charger, lockable glove box,side stand indicator and a new ignition lock which also has the seat opener. Mechanically, the Pleasure remains unchanged and continues to be powered by a 102cc motor with a max power of 6.74 bhp and peak power of 7.85 Nm. 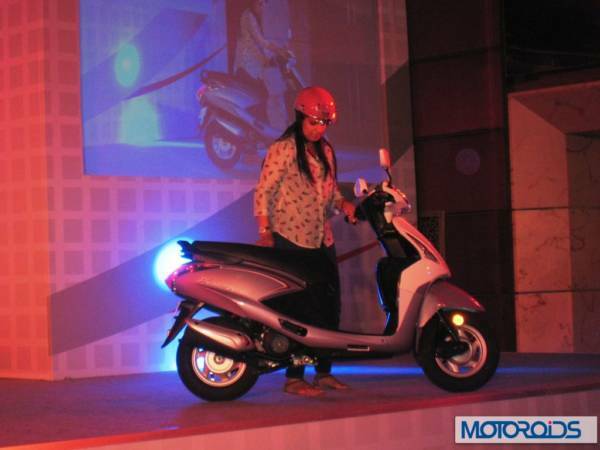 It is being said that the IBS will soon make it to the Maestro, the ‘male specific’ gearless scooter from Hero. (Click here to check out our Hero Maestro review). It remains to be seen if the slight cosmetic makeover that the Pleasure has been bestowed with will be enough to lure more female customers. As for the boys, they’ve always had the Karizma to have all the fun!